Usually I would class a stew as a winter recipe but this one is so easy and tasty that I often make a big batch at the start of the week and take it for my lunch Monday- Thursday. As its still quite chunky its really satisfying and the sour cream adds a lovely fresh taste. If you have it in the evening, any left overs can be frozen for another day (just freeze it before you add the sour cream). I had it as it is but often, when the OH was ravenous so I threw a few new potatoes into his. 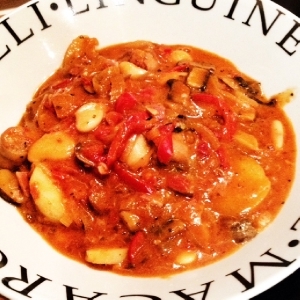 This is a classic Hairy Bikers recipe that I converted into a lower point options. The original recipe can be found here. Pre heat your oven to 200 degrees. Cut the sausages into bite size chunks and brown in a frying pan in 1Kal until browned. Take the sausages out of pan and pop in your casserole dish. Put the chopped bacon into frying pan and fry to your taste, I like I nice and crispy on the edges, and once cooked add this to the sausages. Chop and fry mushrooms in frying pan in 1Kal until cooked and add to bacon and sausage mixture and mix in. In your frying pan cook the onions for about five minutes in 1Kal until soft. Add the crushed garlic and cook for a further minute. Add the smoked paprika, chilli powder, flour and a few crushed chillies if you fancy to the pan and mix in. Stir in tomatoes, chicken stock, tomato puree, Worcestershire sauce, brown sugar and herbs and mix. Add 100ml of water. Tip the mixture into the casserole dish with the sausage, bacon and mushrooms and mix in. Pop the oven for 20 minutes. Then add your drained butter beans and put back in oven for another 10 to 15 minutes. Once cooked, remove stew from the oven and stir through your sour cream. I had this casserole by itself but you could make some mash or roasties to go with it or even pop some par boiled new potatoes into the casserole. I served it with green beans too!